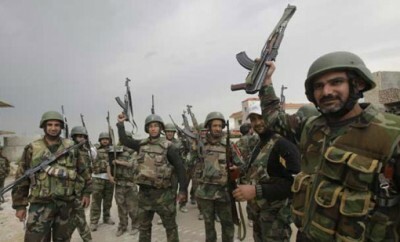 The Syrian army intensified operations against ISIS east of Palmyra yesterday evening when the Cheetah Forces, a subunit of the Syrian army’s Tiger Forces, launched a fresh push in the direction of ISIS-controlled town of Arak. By November 8, the government forces have seized a few of ISIS checkpoints in the area, destroying 2 vehicles belonging to the terrorist group. The army and the NDF continued military operations against Ahrar Al-Sham, Jabhat Fatah Al-Sham and other militant groups in northern Hama. Main developments took place along the Aleppo-Hama highway and near the towns of Aqrab, Buwaydah and Taiibat al-Imam. Some 20 militants were killed and at least 1 vehicle destroyed as result of the attacks by the Syrian army and the Syrian Air Force. The Syrian Democratic Forces (SDF), led by Kurdish YPG units, have recaptured from ISIS more areas north of Raqqa. Last night, they took control of Sheikh Salih Farm, Laqtah and surrounded some ISIS units in the village of Al-Hisha. While the Kurdish forces are able to seize some areas from ISIS north of Raqqa, there are almost no chances that the SDF will be able to isolate the city and set a foothold for its storm. The main difficulty is tensions with Ankara-led forces in northern Syria. The Turkish Armed Forces and Ankara-backed militants have seized 5 more villages, including al-Burj, Shebran and Tal Jiri, from ISIS in northeastern countryside of Aleppo city. The Syrian army’s Tiger Forces, the Desert Hawks Brigade and Hezbollah pressure on Jaish al-Fatah militants in western Aleppo. November 7 evening, the government forces seized about 6 building blocks in the 1070 Apartment Project. On November 8, the Syrian army’s Tiger Forces and its allies continued the operation in the southwestern Aleppo and seized the full control over the 1070 Apartment Project, the Al-Rakhmih Hill and the Motah Hill. Meanwhile, reports have appeared that Jaish al-Fatah is deploying 2,000 more fighters from Idlib to Aleppo. This confirms that Jaish al-Fatah’s defenses are collapsing in the southwestern Aleppo and the current militant striking force is already not enough to achieve any gains in the city. Western experts and local sources expect the intensification of Russia-led military operations in Syria in period between November 10 and November 22. The rumors relates to alleged requests to the Syrian military from the Russian Navy for carrying out flights and firing operations off Syria’s coast. Meanwhile, the Admiral Kuznetsov battlegroup was reported in the area of Cyprus.